” Unlike most NDPers, he was offered a job with the Conservatives After Mulcair left provincial politics in 2007, he briefly considered an offer to become an environmental adviser to Stephen Harper. Despite Conservative claims that Mulcair turned them down over salary (he wanted $300,000, PMO spokesman Dimitri Soudas told Maclean’s), Mulcair said he turned them down because they refused to support the Kyoto accord. SHOULD MULCAIR DROP HIS FRENCH CITIZENSHIP? Thomas Mulcair wants to become leader of the NDP. He also wants to become prime minister of Canada. But there is a little problem. Mulcair holds dual citizenship – French and Canadian. Should you become prime minister of one country when you owe allegiance to another. To become the citizen of another country is automatically to lose one’s citizenship in Denmark or Japan or Norway. Surely that is something we should ask of those who want to lead us – that they give up competing and foreign regimes. A candidate for party leader is expected to give up any previous party affiliations. Should it be different for a candidate for prime minister? He asks us to choose him. Is it too much to ask that he choose us – pure and simple? Should Mulciar drop his French citizenship? SHOULD THERE BE A BY-ELECTION? The relative speed with which Ms St-Denis decided to bolt the party shook up Ottawa, especially since she spent about a decade as an NDP party volunteer. St-Denis said she did not feel at ease in a party that wanted to quickly pull out of Libya, called for the abolition of the Senate and rejected any private-sector involvement in building a new bridge in Montreal. The NDP said the defection was a betrayal of the wishes of her riding. And they have demanded that a by-election be called in her riding. Should an elected member of Parliament be able to cross the the floor and join another party without consulting his or her constituents? Should an elected member who wants to join another partyy be forced to resign, then run again under the label of her new party? Should there be a by-election in this case? 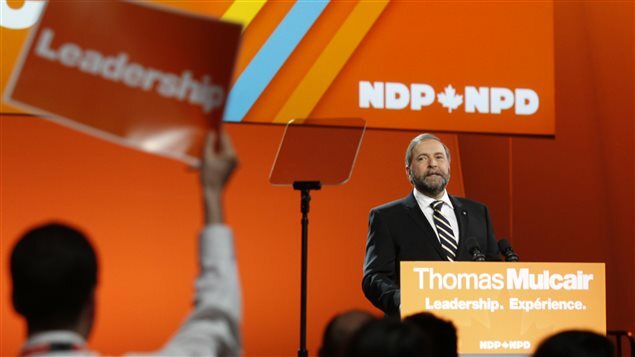 Sometime today Thomas Mulcair will announce whether he will run for the NDP leadership. If he decides not to run, the air will go out of the leadership race and Brian Topp will win in a walk. This will deprive the NDP of an exciting race in which to sign up new members. But if Mulcair decides to run there is no guarantee that he will win. Far from it. Each member has one vote for leader. There are 90,000 NDP members. All but 1800 of these reside outside Quebec. That is two per cent. It will be an enormous challenge for Muclair to build up a majority from this tiny base. 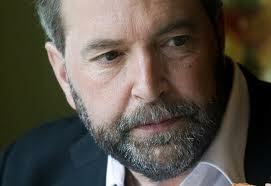 Furthermore Mulcair is perceived by many as an over-aggressive , abrasive politician who takes no prisoners. Ed Broadbent and Roy Romnanow are already supporting Topp who has a large lead. Topp’s leading problem is that he has never had any public elected office and does not have a seat in Parliament. SHOULD THE NDP AND THE LIBERALS MERGE? Just a few days after Jack Layton’s funeral, new merger talk has broken out between the NDP and the Liberals. On his flight home from the funeral, former prime minister Jean Chretien boasted to a journalist that his plans for a Liberal-NDP merger would have stopped the Conservatives from taking power this year. Liberal Justin Trudeau says he is not convinced of the benefits of a merger but he could change his mind. Betweenoth Jean Chretien and former NDP leader, Ed Broadbent, favour a merger of the two parties. Just a few years ago, Stephen Harper led the fight to unite the right between the Conservatives and the Reformers. Look at Harper now. He leads a majority Conservative government. 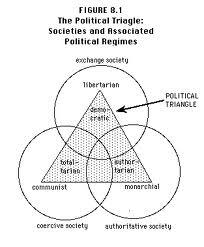 Is it time for some one like Bob Rae to grasp the nettle and unite the progressive left. Will the NDP and the Liberals get anywhere separately? Or will they just guarantee the Harper Conservative will stay in power indefinitely? CAN THE NDP SURVIVE THE LOSS OF JACK LAYTON? In his last letter to his party, Jack Layton advised them to make haste choosing a new leader who should be in place early in the New Year in plenty of time for the next election. Jack was the smost credible and charismatic leader for the Canadian Left. Is they anyone who can take his place? There are names galore but are there any real leaders? Thomas Mulcair – A Quebecker with a big brain and a hot temper. 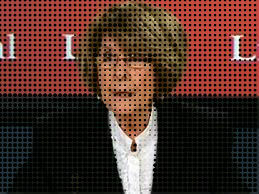 Libby Davis – Vancouver – heavy on the social democratic wing of the party. She is now deputy leader. Gary Doer – successful NDP premier of Manitoba before Harper named him ambassador to Washington. Doer balanced his budget and recognized the rights of gays to marry. He is perfectly bilingual and would be a formidable candidate. Could Layton’s widow, Olivia Chow, succeed her husband. Do other possible successors occur to you? Do you think any of the successors mentioned so far could defeat Harper? DID JACK LAYTON LEAVE A POLITICAL LEGACY? 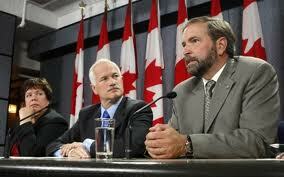 NDP leader Jack Layton dies this morning from cancer at the age of 61. Just a few months after leading the NDP to its greatest victory in federal politics, le bon Jack had the fruits of that victory suddenly snatched from him by death. 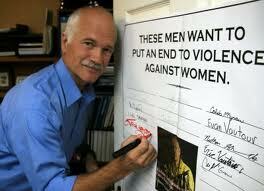 Did Jack Layton leave a political legacy. Did he change the face of Canadian politics? Certainly his victory in the last federal election was historic. In addition he drove the Liberal party into a small redoubt from which they may never recover. Layton, a Quebecker, celebrated Quebec nationalism. He talked about future taalks to bring Quebec into the constitution. He was open to stronger language laws in Quebec to protect the French language. He expanded many times over the reach of the NDP party in Quebec. He reduced the Bloc Quebecois to a parliamentary rump. He established the NDP as the government-in-waiting in Ottawa. Jack Layton’s political time was cut short. But it seems to me he accomplished much. SHOULD NDP LEADER, TURMEL, STEP DOWN? It is now clear that NDP interim-leader, Nycole Turmel, was a member of two separatist parties, the Bloc which she left only in January of this year and Quebec Solidaire, of which she is still a member. Turmel, a former labour leader, explains that she identified with the social democratic aims of these parties but she never supported their separatist options. Furthermore she has been a member of the NDP for 20 years. Is that explanation good enough? The issue of course is not about Turmel’s changing parties. Many politicians have done that. Winston Churchill himself switched from the Conservatives to the Liberals, and then back again to the Conservatives. He famously remarked: “Anyone can rat, but it takes a certain amount of ingenuity to re-rat.”The issue is whether Turmel’s federalist commitment is solid. She says flatly she has always been a federalist when it comes to the separation of Quebec. But will that declaration be sufficient, say, for NDP supporters in the West? Maybe not. The Globe ends its editorial on this matter this morning with a snarky comment: “…. the NDP’s suitability for the role of government-in-waiting is at best tenuous, unless the government in question is that of a sovereign Quebec.” Ouch! By the way, Liberal leader Bob Rae was a member of the NDP for more than 20 years. Does that mean his commitment to liberal principles is tenuous? Should the NDP cut its losses and ask Turmel to step down? 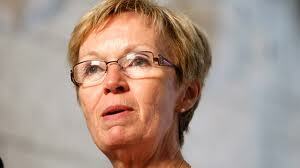 Or should the NDP circle the wagons and continue to support her as interim-leader? IS 50 PER CENT-PLUS-ONE ENOUGH FOR QUEBEC SEPARATION.? Almost half the NDP caucus in Ottawa comes from Quebec. There is no doubt there are some sovereignists in this group. Which is why NDP leader, Jack Layton, is struggling to clarify his position on Quebec’s separation from Canada. After several false starts Mr. Layton has fallen back on the NDP’s Sherbrooke Declaration of some years ago in which the party outlined its position on Quebec separation. The Declaration stipulates that in the event of another referendum, a federal NDP government would stand aside and let Quebec’s National Assembly draw up the referendum question , and that it would accept 50 plus one as a clear enough endorsement of succession. When he was asked directly about this, Layton replied that the Sherbrooke Declaration stands as party policy. Now there is no doubt that this policy on seccession is supported by all poilitical parties in Quebec (federalist or separatist). Even federalist Quebeckers support the 50 plus one number. Our friend, Tony Kondaks, expresses concerns about the NDP position in a well-crafted letter in this morning’s Gazette. One of Tony’s major concerns is that the NDP policy would enable Quebec to make a unilateral declaration of independence. That doesn not worry me much. If the seccession proceedings ever got that far (which they won’t) the question is not whether Quebec would make a unilateral declaration of indpendence but whether anyone in the international would recognize such a declaration (absent a clear question and a clear majority). I don’t believe they would. Is 50 per cent-plus one enough for Quebec separation enough for Quebec separation?